Your home’s insulation is vital to temperature control. The choice you make when it comes to how you insulate can be the difference between a drafty house that never seems to warm up in the winter and one where every incremental degree change can be felt. With the winter months approaching, and higher energy bills looming, this is an especially relevant topic. As homeowners, we certainly want to stay warm, but not at the ridiculous expense that may insue if your house is not properly insulated. The hardest part about the insulation debate is the number of options available. With so many insulation types to choose from, it is difficult to tell which ones really do their job. In this article, we outline insulation types by material and rating so that you can make the best choice based on your home and regional climate. R-value is a measurement of a section of insulations resistance to heat. The higher the R-value rating, the less heat is allowed to pass through the insulation. As it relates to your home’s heating, if you are using the highest R-value insulation, the house will retain heat. Thus, the house stays warm and the heating source does not have to continue converting energy to maintain temperature. So why wouldn’t every homeowner just use the highest rated insulation? Because R-value is a cost saver, it will certainly determine price of insulation. That said, if you are living in a more tropical climate, where heat only comes on maybe for a month a year, the high R-value insulation might not be worth the investment. On the other hand, in Northern Maine, where truly warm weather only comes around in August, high R-value is paramount. 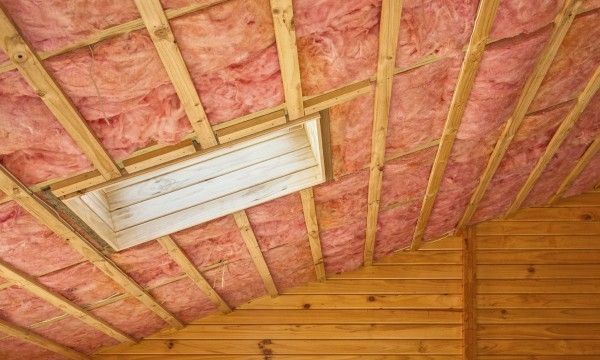 Fiberglass Insulation: This is the big pink rolls you are used to seeing along exposed attic floors, but trust that they are behind walls on your home’s main levels as well. Fiberglass insulation works like a giant blanket that is stuffed in between studs behind walls and between joists on floors and ceilings. With fiberglass, R-value has almost everything to do with the thickness of the insulation. The mistake a lot of DIY’ers make is buying high grade fiberglass rolls (which are presumably super thick) for a tight space. Forcing thick insulation into a small space will actually compromise the R-value. Fiberglass insulation works by catching air in its spun particles. If it is pressed flat, the air has a more straightforward path in or out of your house. Foam Insulation: Foam insulation is much like fiberglass in that thickness determines R-value. It is sold in sheets and can be easily cut and trimmed to fit any space. Generally speaking, foam is not as good of an insulator as fiberglass. It does serve a unique purpose, however, in that foam is also moisture resistant. Installing foam will provide a decent layer of insulation in addition to some absorption functionality. Blown-in Insulation: Blown-in insulation is exactly that- an insulation comprised of shredded material that is blown through a vacuum system in between studs and joists. Blown-in insulation is a great option with respect to R-value. Like styrofoam insulation, blown-in R-value is very much determined by thickness. That said, if you are planning on using blown-in insulation in your attic, you might want to find another home for the Halloween and Christmas decorations. Disrupting the blown-in insulation as you move through the attic space, rummaging through boxes of strung lights is the surest way to compromise the insulations R-value. A quick audit of your home’s needs is the first step to figuring out exactly what type of insulation is needed to keep your house warm in the winter and cool in the summer without taking on a second mortgage. Consider your region’s climate, and how often you are using heating and cooling and when. This will give you a good sense of the type of R-value you will need in an insulation type. From there, you can pick the application method and start to think about things like moisture as it pertains to certain room in your house. The most important thing, however, is that if you suspect your home is not properly insulated, you begin to investigate immediately. You would be shocked at how much money you are truly throwing out the window (quite literally) when you fail to maintain your home’s energy efficiency.